These are great as appetizers or even as a light lunch meal. 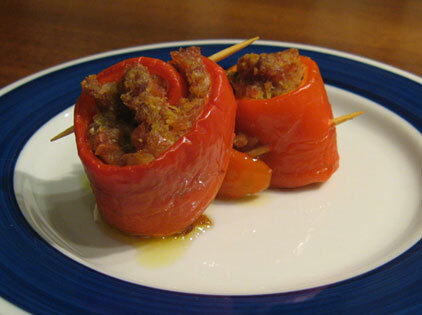 My mother-in-law makes these with meaty red and yellow peppers, they really are the best peppers to try these with (I tried this summer with green bell peppers but they were too short to roll up well). Pour enough olive oil into a long tray to cover bottom. Place the rolled up bell peppers flat on one layer, close to each other (you should see the meat filling from the top and rolled up peppers). Bake for 20-25 minutes or until tops of rolls are slightly browned. Remove and let cool 10 minutes before serving. Also tasty served slightly warm.